So, you have created a blog for you on Blogger. Blogger is simple to use and has many features in it that take care many things for you. 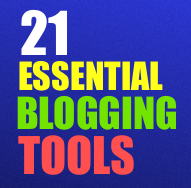 This is my suggestion of 21 must have essential tools for your blog. 5. Feedblitz– allows your blog visitors to subscribe by email to your new posts. 9. GIMP-GNU Image Manipulation Program. It’s totally free. 10. My Blog Log– Tracks outgoing links to let you know where your traffic is going. 15. Vimeo– upload your videos in Vimeo and embed those videos in your blog posts. 17. Disqus– better commenting system for your blog. 18. Imageshack.us– best choice for free image hosting. 19. Technorati– it allows you to claim your blog in this huge blogosphere and increases traffic to your blog. 21. Haloscan– A free commenting and trackback system for web logs and websites. *Note: Please let me know if you think I missed other useful blogging tools! I will include those in the next post.